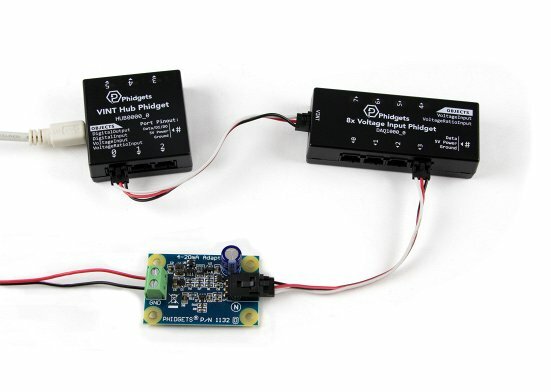 4-20mA sensors can be connected to and powered by the provided terminals on the 4-20mA Adapter board. The 1132 will measure the current passing through the attached sensor and convert it to a voltage between 0 and 5V. 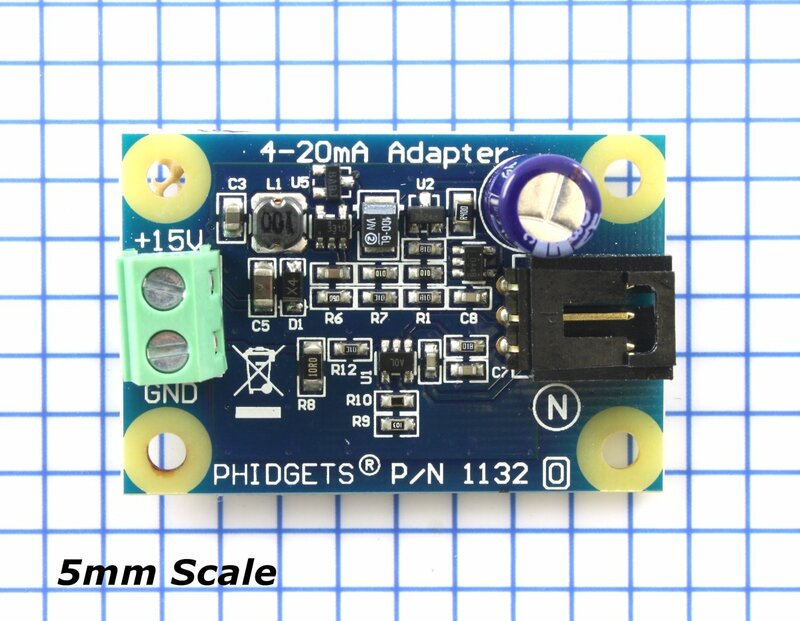 The 4-20 mA Adapter board internally produces +15V from the 5V supply which is used to power the connected sensor, eliminating the need for an external power supply. If the Adapter board is being used in very noisy environments, place a ferrite bead on the sensor current loop close to where it is attached to the 1132. 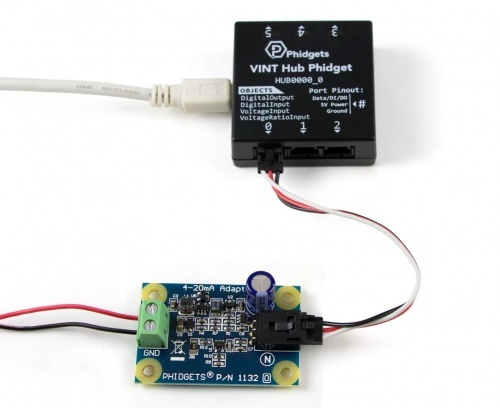 Connect the 1132 to the HUB0000 with the Phidget cable. 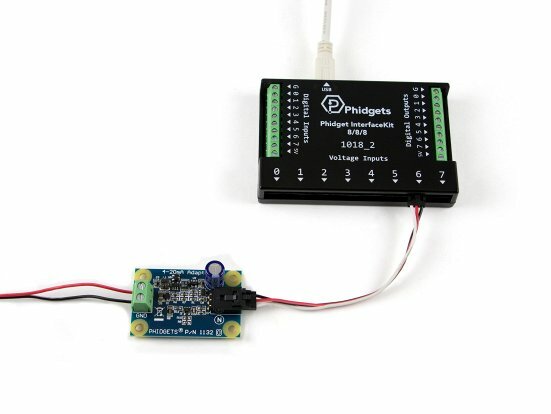 Connect a sensor with a 4-20mA output to the 1132. Now that you have everything together, let's start using the 1132! 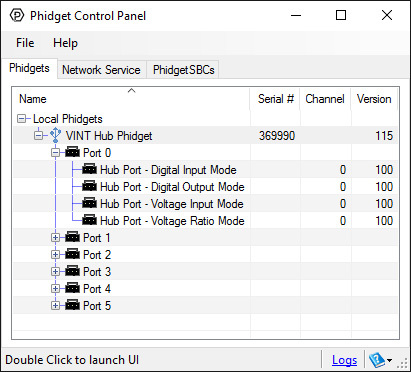 In order to demonstrate the functionality of the 1132, we will connect it to the HUB0000 , and then run an example using the Phidget Control Panel on a Windows machine. Linux users can follow the getting started with Linux guide and continue reading here for more information about the 1132. Select the 1132 from the Sensor Type drop-down menu. The example will now convert the voltage into amperage (mA) automatically. 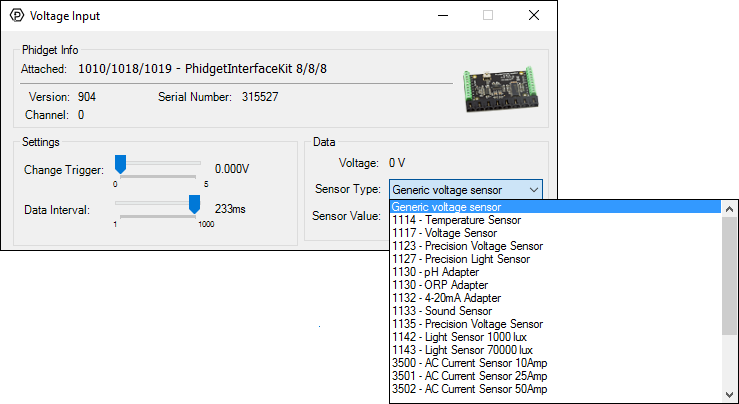 Converting the voltage to amperage (mA) is not specific to this example, it is handled by the Phidget libraries, with functions you have access to when you begin developing! Sensors can be connected to and powered by the provided terminals on the 1132. The 1132 will measure the current passing through the attached sensor and convert it to a voltage ranging from 0 to 5V. The adapter board is a non-ratiometric device, so make sure to connect it to a Voltage Input object. If the formula gives a range below 4mA (i.e. a voltage less than 0.9V), then this indicates that the sensor is open. The 1132 board internally produces +15V from the HUB0000 (compatible products) analog voltage. 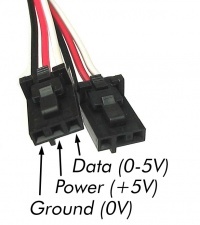 This supply rail is used to power the connected sensor, eliminating the need for other external power supplies. If the 1132 is being used in very electrically noisy environments, place a ferrite bead on the sensor current loop close to where it is attached to the 1132. 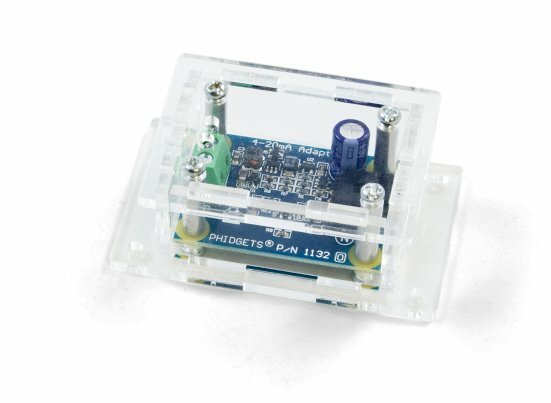 This helps prevent energy coupled into long runs of wiring from causing computer problems. 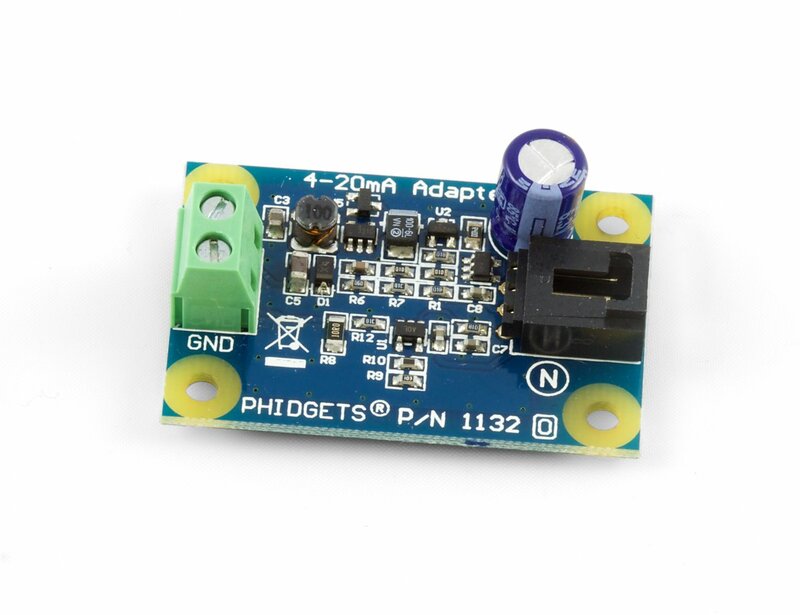 Review the datasheet for the 4-20 mA sensor that you have selected to be certain that it complies with the specifications of the 1132. Mostly you want to make sure that the sensor you want to use does not require more than 15V and that its capacitive load is equal to or less than 1.5µF. The following sensor has been successfully tested with the 1132.